BURRIDGE proved their own worst enemies again as they let slip a winning position in their six-run Southern League premier division defeat at Alton. The visitors bowled the hosts out for 139 with Brighton Mugochi (three for 22) and Sullivan White (five for 44) doing the damage. Rick Ankers’ side looked to be cruising as James Richards (39) and Joe Collings-Wells helped guide them to 73 for two but then they collapsed to 133 all out. Havant recovered from a poor start to force a winning draw against league-leaders Lymington at Havant Park. After electing to bat the home side lost their first three wickets with just 14 runs on the scoreboard. The middle-order, however, came to their rescue as Chris Stone (47), Richard Hindley (46), Andrew Gorvin (32) and Jeremy Bulled (36) led the fightback. Lymington were set a target of 217 but finished on 154 for seven with Brad Taylor (three for 36) and Steve Matthews (three for 24) leading the Havant attack. 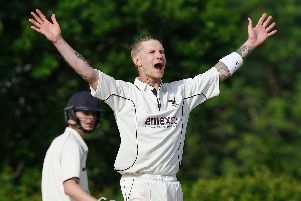 Sarisbury Athletic gave their division one survival chances a big boost with a three-wicket win over Bournemouth. Jordan Wright (three for 20) and Chris Sanders (two for 15) bowled well as the visitors were all out for 158 runs. Ricky Rawlins (20) and Jamie Dunn (24) got Sarisbury off to a solid start. Sanders (28) and Tom Mills (32 not out) guided them home. Hambledon suffered a nine-wicket defeat to division two leaders Totton & Eling. Skipper Will Bond (76) top-scored as his side finished on 205 for eight but it proved little problem for the visitors who coasted to victory. Gosport Borough suffered more batting woes as they were bowled out for a miserly 130 against Fawley in division three at Privett Park. Greg Kitchen (29) and Jack Richards put on 21 for the final wicket for Borough. Despite the efforts of Simon Creal (three for 23) Fawley’s final pair won it. Waterlooville lost to Basingstoke & North Hants. The league leaders were bowled out for 142 with Ashan Silva taking three wickets for 29 runs. Alex Shephard (40) and Jon Hudson (33) got Waterlooville to 141 for seven. Purbook slipped to a 70-run defeat at Bashley seconds.